When your Android phone or tablet fills up with apps, it's time to review what you have installed and do some housecleaning. Here's how to uninstall the downloaded apps you don't use anymore. First, a warning. If you want to delete an app that shipped with your phone, you're mostly out of luck. Shy of going to drastic measures and rooting your phone, the system apps have to stay. Most of these apps are tied to the inner workings of your phone, and deleting them could break other apps. System apps include Gmail, Google Maps, Chrome browser, and Google Search. Some manufacturers, such as Samsung and Sony, put their own system apps on their phones and tablets in addition to the Google apps, and some, like the Amazon Kindle, remove all Google apps entirely and include a different set of system apps. 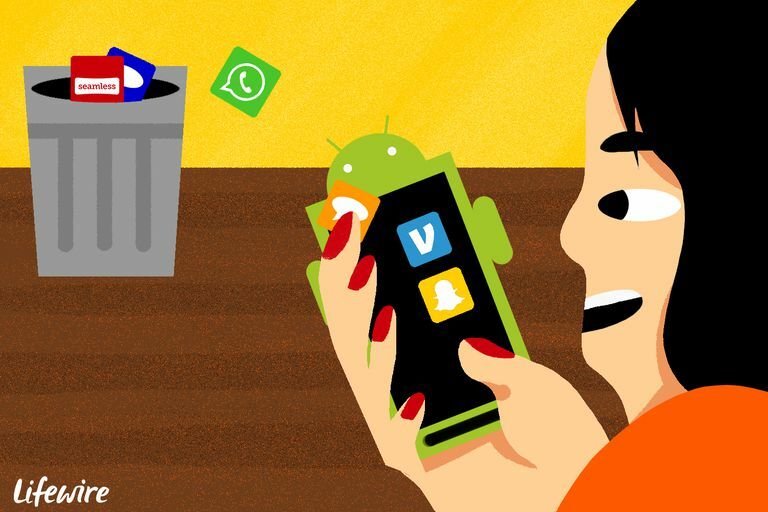 If you have a standard version of Android, the steps to delete or uninstall an app are simple. There may be some variation for some varieties of phones, such as those made by Samsung, Sony, or LG, but this method works on most of them. Tap Menu (either a hard or soft button). Select Settings > Applications > Manage applications. Tap the app you want to delete. Tap Uninstall to remove the app from your device. If there's no uninstall button, it's a system app, and you can't delete it. For Android Ice Cream Sandwich version, go to Settings > Apps and use the steps for the older versions of Android. Drag the app onto the Home screen. Continue dragging to the upper left corner, where you will see a trash can and the word Uninstall. Release your finger over the Uninstall button. If you only see an area labeled App Info at the top of the screen, you cannot delete that app. Tap the Recent apps button followed by Task manager. Go to the Download tab and find the offending app. Tap the Uninstall button next to the app. If you don't see an Uninstall button, you can't delete the app using this method. Go to the Home screen and tap on the Apps tab. Tap the Device tab to show only the apps on your Kindle as opposed to all the apps you could potentially store on your Kindle. Long-press on the app you want to remove until you feel or see a response. It's worth noting that you're not limited to the Amazon App Store when you install apps. While you retain access to Kindle apps you've installed through Amazon, you don't necessarily have that same access to apps you installed through third-party app stores or side-loaded on your device. Nearly all Android app stores let you keep your license to reinstall a purchased app. If you uninstall an app you bought from Google Play, for example, you can download it again if you change your mind later. If you want to delete your access to a purchased app forever, you must do that through your Amazon account on the web. It is a much more involved process than uninstalling it from a device. This may come in handy if you deem an app offensive and never want to see it again. Occasionally you may run into an app that makes other apps, so you find yourself deleting apps you don't remember installing. You're not imagining things. You can read more about avoiding Android spam, but if you can identify the offending app, you can get rid of the problem. Fortunately, app stores are cracking down on this sort of nuisance.